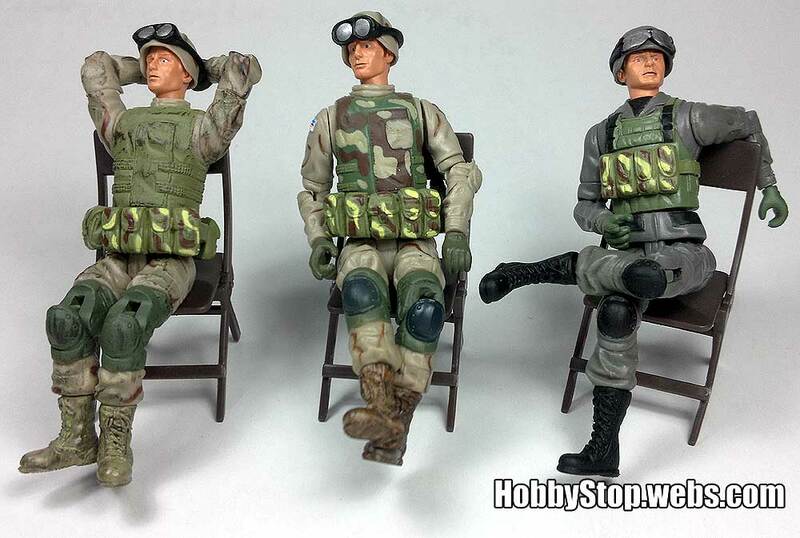 "Army builder" figures are always popular, especially among 1/18 military toy collectors, but are these guys worth a look? 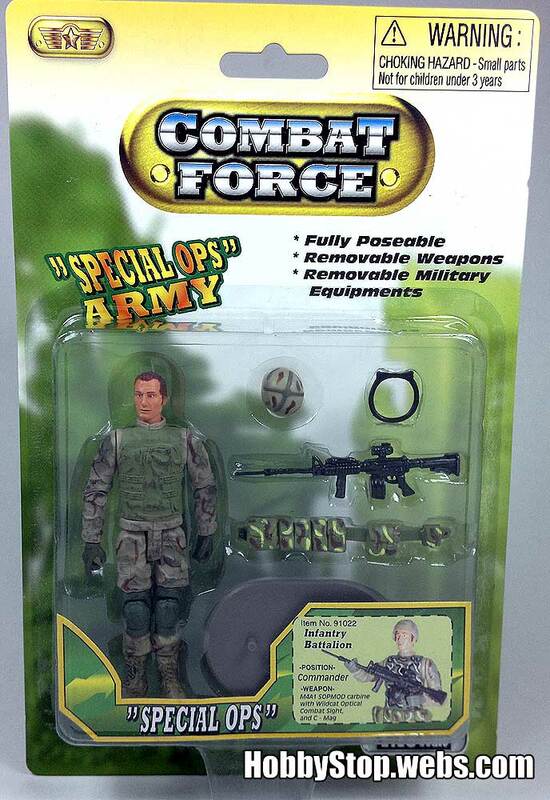 I discovered these action figures in early 2011 - only two Chinese eBay stores carry the line. Reasonably priced and reasonably detailed, I decided to grab a few. 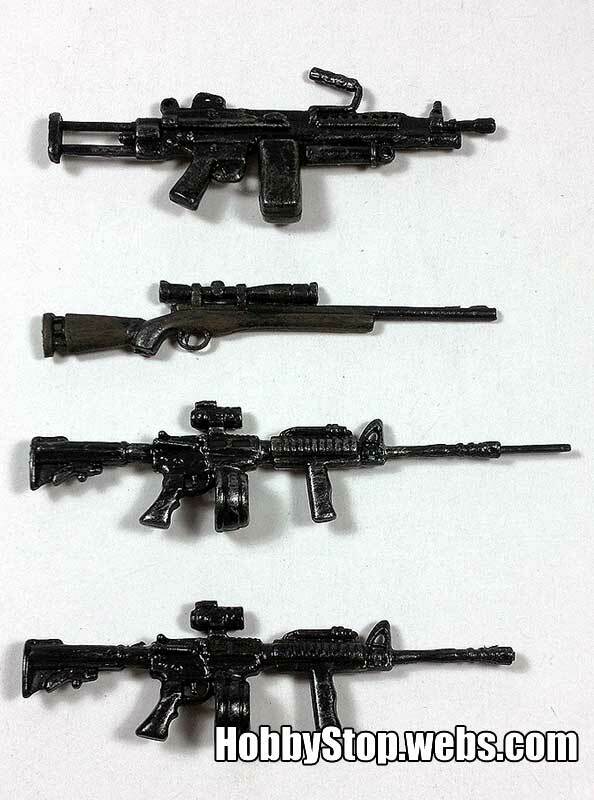 The figures come in 3 arbitrarily-named types - (L-R) "Infantry Battalion", "Armor Battalion" and "Ranger Battalion", with 3 figures for each type - Commander, Sniper and Squad Assault, for a total of nine figures in the line. 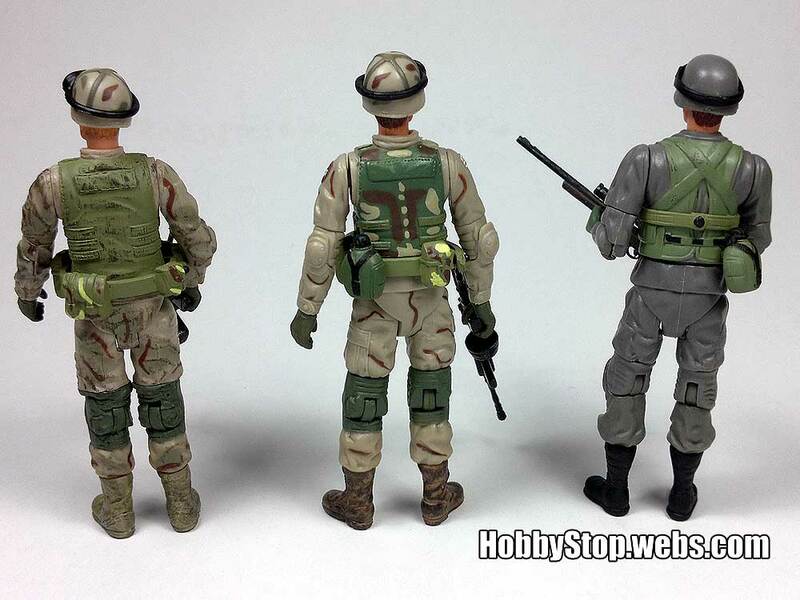 Given that these are only approximations of existing soldier uniforms, I won't bother with pointing out inaccuracies. The figures come on a fairly basic-looking card with a flimsy clear blister. The following pics show the Infantry figures, but the layout of the other ones are identical to these. All the figures share the same card back design. 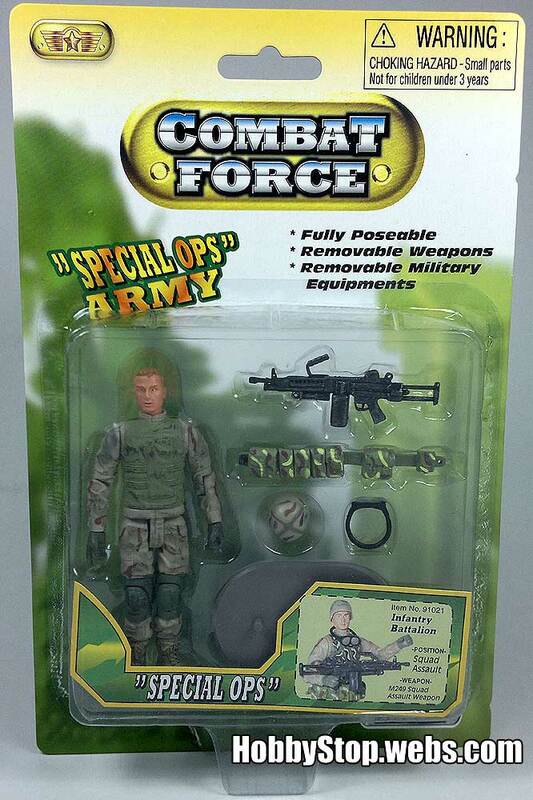 Here's the SAW gunner out of the packaging. Pretty basic, with helmet, goggles, belt, weapon, and stand. Yep, basic all right. The helmet is a bit small and the goggles too big, but not overly so. Unmodified, he'd make a great background figure for displays, and with a couple of mods he might even be foreground material. The face sculpts look pretty good - BBI good, in fact. They're cleanly painted too; only the eye paint makes them look a bit goofy. Each "Battalion" type (Infantry, Armor, and Ranger) has their own body sculpt, which is identical for each figure (Commander, Sniper, and Squad Assault). The Infantry figure (left) has a rather plain vest over plain BDUs with a decent attempt at desert tricolor camo (more on that later). He also has a belt with 7 utility pouches moulded on (5 in front, 2 on the back). 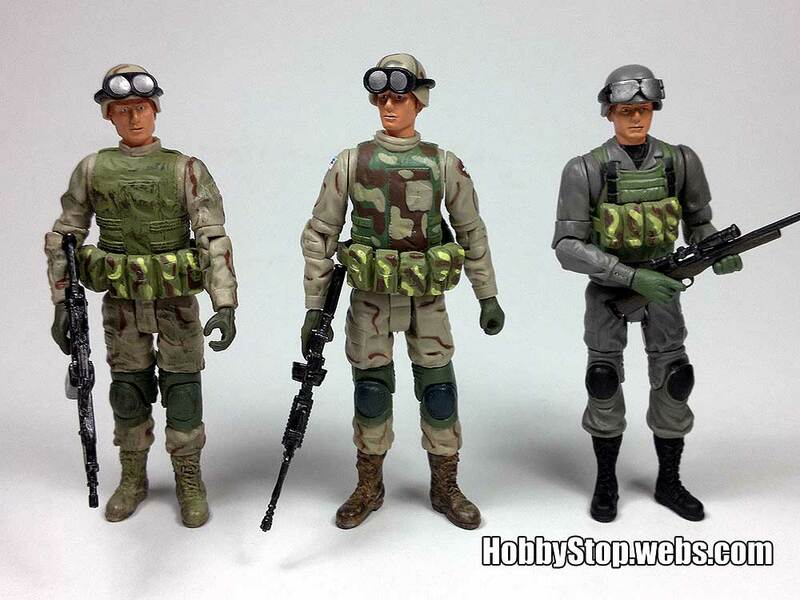 The Armor figure (middle) has a slightly different body sculpt, with a different vest (with a hideous camo scheme), moulded elbow pads (unpainted), a US flag on his right shoulder, and a generic shield-shaped unit patch on his left shoulder. His belt has 5 moulded pouches, and a glued-on canteen. 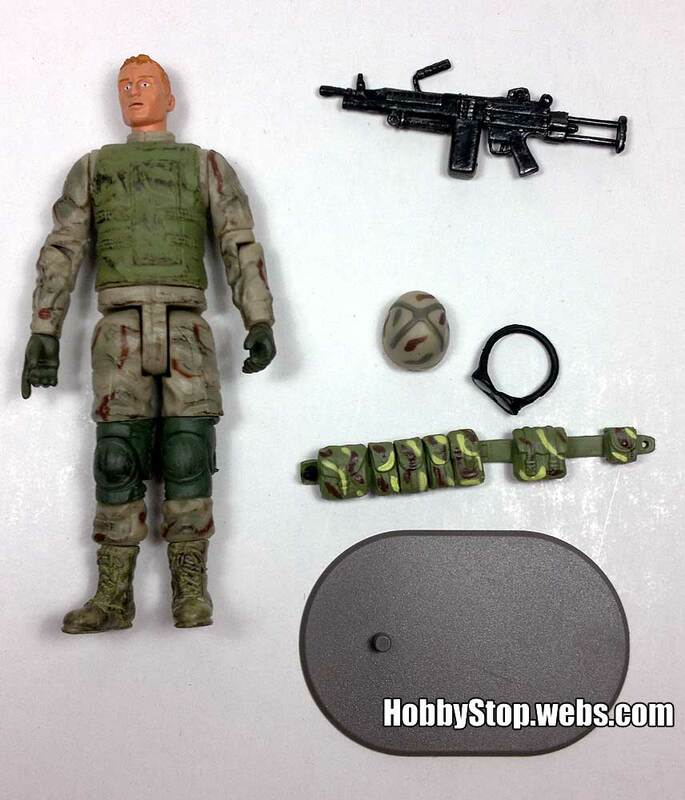 The Ranger figure (right) looks the plainest, with plain grey BDUs and a light green RACK vest (or an approximation thereof). The 4 chest pouches are strapped on, and a separate canteen can be attached to his waist. 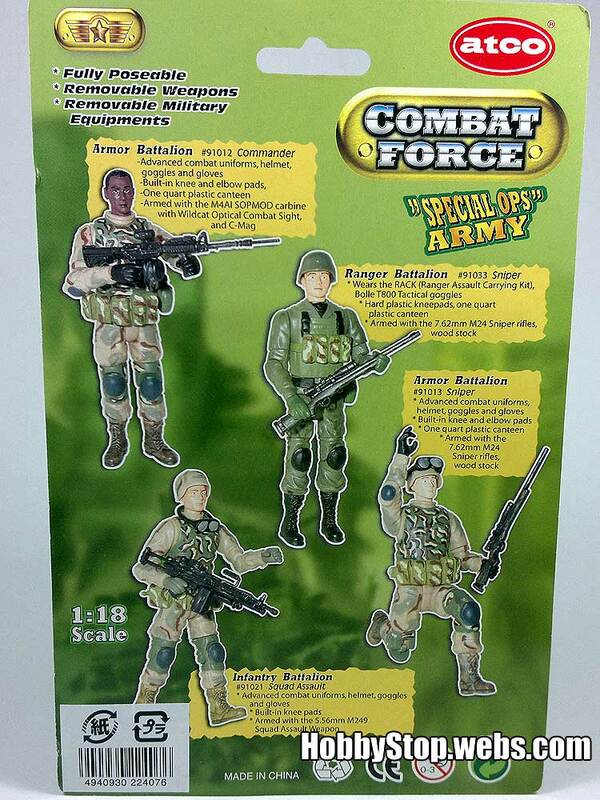 As mentioned earlier, each "battalion" type comes with 3 figures, each with 1 included weapon - the "Commander" with an M4, "Sniper" with an M24 SWS, and "Squad Assault" with an M249 SAW Paratrooper. Here's a shot of the weapons. As you can see, the stock M4 (third down) has a thin rod sticking out of the barrel for some reason. It may be from the injection mould and they didn't bother cutting it off. The plastic tray on the packaging is shaped to accommodate it too. Anyway, it's easily trimmed off with a knife (bottom). The weapons are moulded in a hard glossy plastic drybrushed all over with silver. The sniper rifle's "wood" parts are painted dark brown. The SAW ammo drum should be olive green, but is easily painted. They look OK despite the soft detail, and are quite durable. They're not bendy like PTE weapons, or undersized like some FOV ones. The belt has a similar peg-and-hole fastener to BBI's offerings, but is moulded in a thicker material. Because of this, it will not stay fastened for long. I ended up supergluing the belt closed before fitting it, then slipping it over the figure's feet and up to the waist. The helmets and goggles are nothing to write home about, but the "Ranger" figure's goggles are good enough to re-use on other figures. Each figure has 18 points of articulation: Swivel neck, cut shoulders, cut biceps, swivel elbows, cut wrists, swivel waist, T-crotch hips, cut thighs, single-hinge knees, and cut ankles (above the boots). Decent, but the lack of ball shoulders and hips are a no-no. 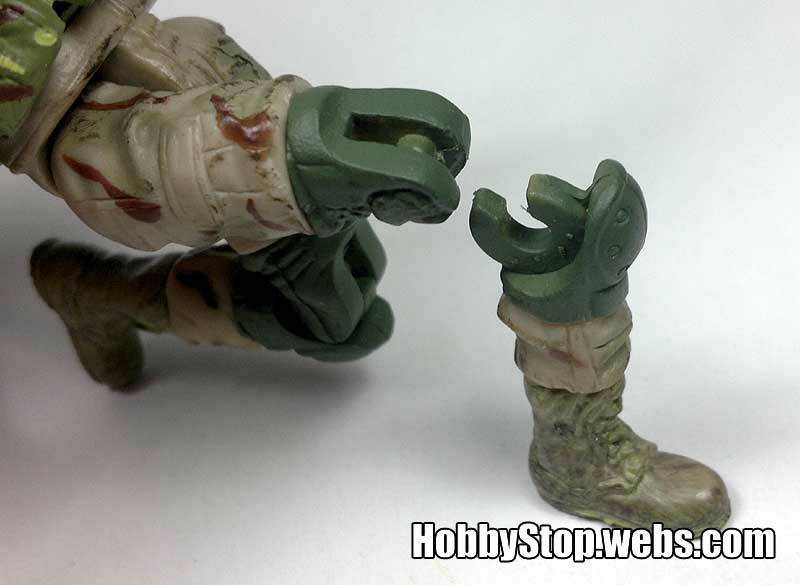 Hell, even cheap PTE figures have superior articulation. As a result, posing these guys effectively is difficult, especially aiming and kneeling poses. The unsightly knee hinge is another sore spot. Dynamic posing is limited, but you can get decent running poses (with the stand) or relaxed poses. The figures are moulded in their base colour (tan or grey, depending on which) with painted details. While the green camo colour schemes are questionable, the paint itself is durable and doesn't scrape or flake off. 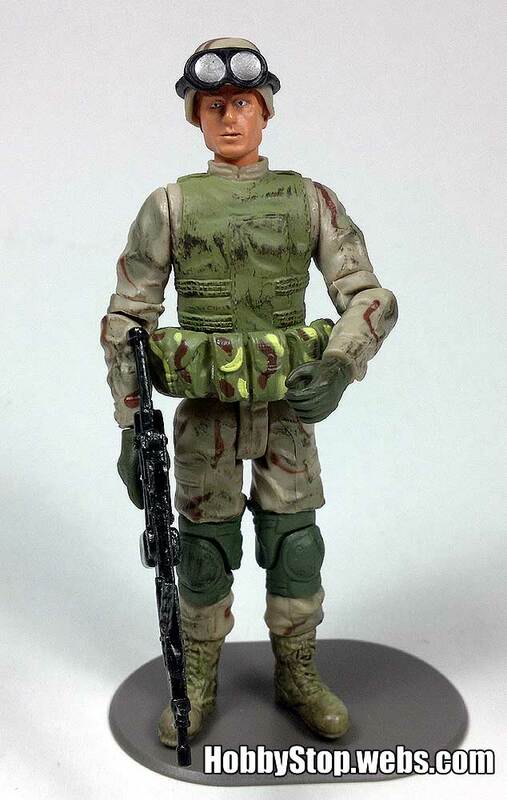 The Ranger figure has the least paint on him and looks rather plain-Jane. 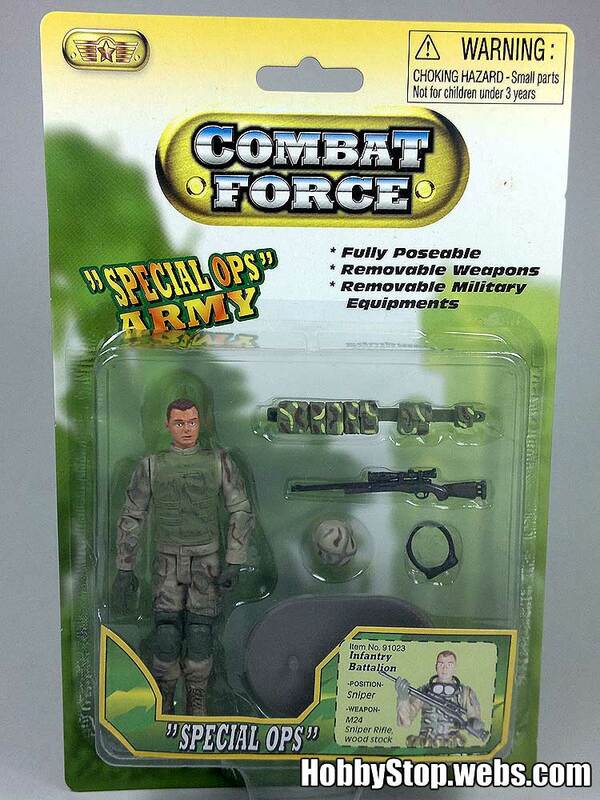 A competent modeler could paint an urban camo scheme on his BDUs, or use him as a base (as I did) for a custom figure. Here's a comparison shot with figures from other toy lines (click the pic for a larger version). Left to right: Atco Infantry, Atco Ranger, Atco Armor, PTE Desert Marine, PTE China-exclusive PLA soldier, Tieka OurWar 101st Airborne trooper, BBI Marine, Hasbro Desert Ambush Duke, FOV/Bravo Team Ranger, TRU generic tank driver. 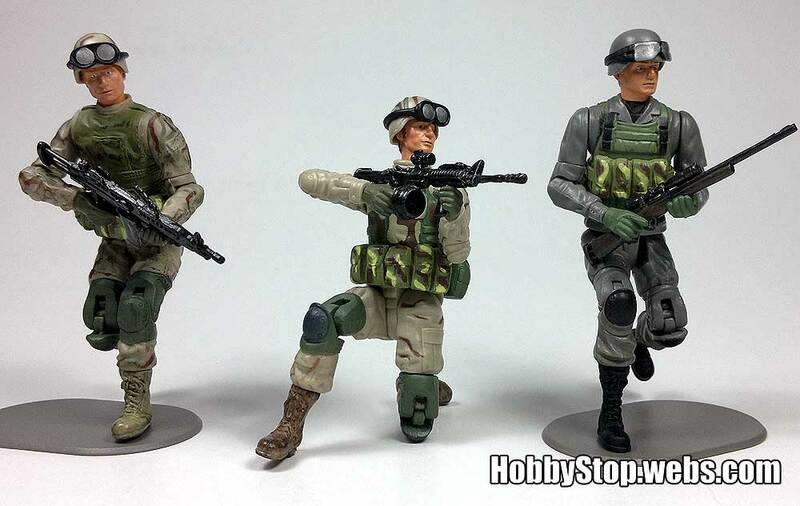 As you can see with the "Armor" figure (third from left), the simple addition of a PTE tactical vest improves the look immensely. Even without it though, they do mix well with other military figures. As far as I can tell, only two Chinese eBay sellers (ShopOriental and QQmodels) sell these. Of the two, ShopOriental is a bit cheaper at AUD$6.85 a figure, or AUD$16.68 for a set of 3 figures (with free postage too). Are they worth it? There are better-looking army builders out there, but those either cost more (BBI, Hasbro, Tieka) or have limited posability (FOV). There are better-articulated ones out there, but the comparably-priced ones look even more generic (PTE). For such an inexpensive figure to offer decent playability and detail, I do believe these are worth a try. While they're far from perfect, I'm quite happy with them and, with a few modifications, they've taken their place amongst my GI Joe custom figures.